THE GOG BLOG by Rory Spears, Editor and Director of Content. 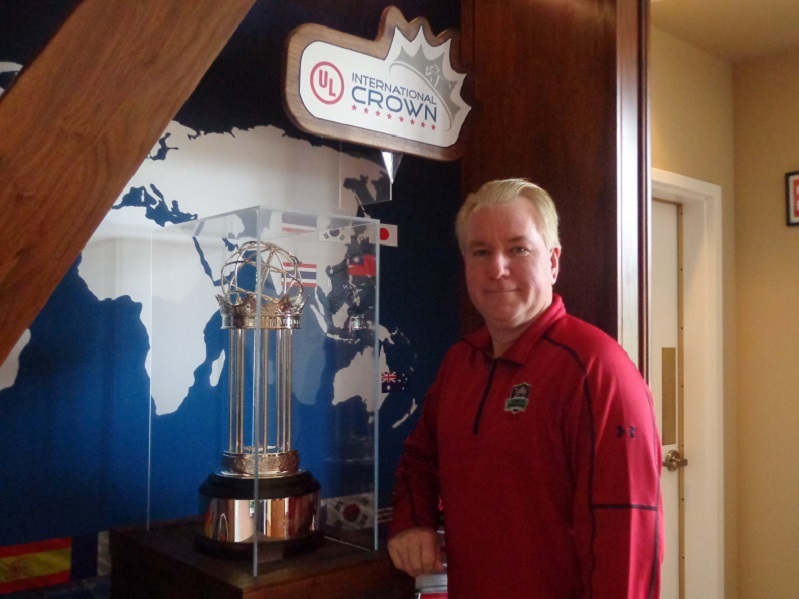 With the LPGA UL International Crown Trophy. This coming Monday the LPGA and the Chicago-Tap (Taiwanese American Professionals) have come together to produce a special event. This event is an exclusive opportunity to meet LPGA star Yani Tseng at Roy’s Restaurant (720 North State Street) in Chicago. Tseng has 27 professional wins on tour, and was the No.1 player in the world from 2011 to 2013. This special event runs from 11:30 am through 1:15 pm. With the schedule breaking down just like this. 11:30-Am to Noon there will be mingling and a putting clinic with Yani. Noon to 12:45 Pm will be a lunch and Q & A session. 12:45 through 1:15 will be more time to mingle and get pictures taken. Cost of the event at Roy’s is $15 and includes lunch, a beverage, tax and gratuity. During the lunch there will be a chance to win tickets to see the LPGA UL International Crown, that will be conducted from July 19-24 at the Merit Club in Libertyville. The UL International Crown is a competition that involves the top 8 countries, with the highest world wide ranking team of players. The teams will be announced after this weeks ANA Inspiration, and the players named after the KPMG Women’s PGA Championship. The purse of the event is $1,600,000 and the defending champion is Spain, that won the inaugural crown championship in 2014 at Caves Valley Country Club outside of Baltimore Maryland. For more information on the UL International Crown, please visit ULCrown.com. THE GOG BLOG BY Rory Spears, Editor and Director of Content. Follow Rory on Facebook, Linkedin and Twitter @GogBlogGuy. Sporting Kapalua wear and logo’s this week. The Gog Blog has been saddened by the passing of Kapalua’s Gary Planos, an Evanston native who went on to caddie at Westmoreland Country Club, and then become an Evans Scholar. Planos went to the University of Illinois before heading off to Hawaii and work his way up at Kapalua. While service information is not yet official, it appears there will be a memorial service this week in Maui by the Kapalua resort. More details as we get them. 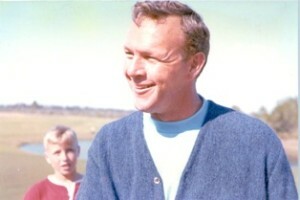 I recommend the tribute by Global Golf Post’s Jim Nugent, posted at Globalgolfpost.com. 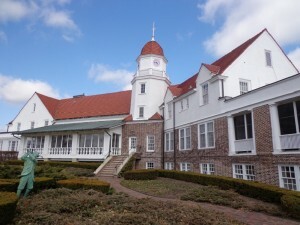 The American Club in Kohler Wisconsin. The summer season is right around the corner in KOHLER Wisconsin, and while the PGA is gone, there is plenty for you to come up and enjoy in the months ahead. The Restore and Explore specials at the Kohler Waters Spa will run through April 28th, receive $50 dollars off on facials, body services and hydrotherapy treatments. Get your body in shape for golf season, it’s about ready to tee off. Need more, well DESTINATION KOHLER has more on and off the golf course, and coming April 29 to May 1 is the Kohler Festival of Beer that has premiere brewers in from around the country. Beer classes and live music goes along with Wisconsin’s finest foods. 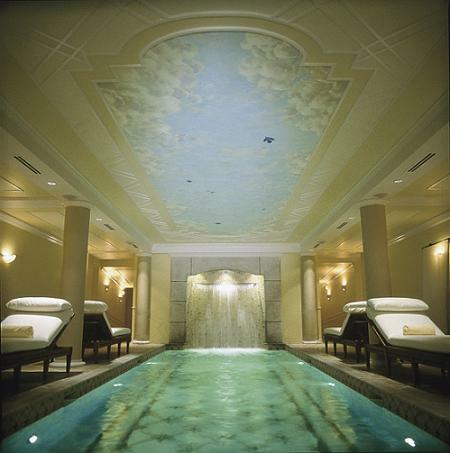 The soothing Kohler Waters Spa (L). Shipwreck a Par 3 hole on Whistling Straits one of the top golf courses in world according to multiple golf publications, will open for the season before long. The Golf Escape Package is great way to play the highly rated Pete Dye designs early in the season before peak rates apply. MEMORIAL DAY WEEKEND PACKAGE May 27 through May 30 enjoy some of Kohlers more enjoyable pastimes, with some great discounts attached. THE CHEF’S TABLE a new experience that will show you what a real 3-Course meal is. Details at Destinationkohler.com or call (888)-293-7337. See more on Facebook/Twitter. 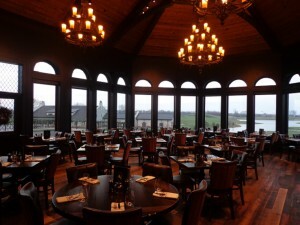 McWethy’s Tavern at Mistwood Golf Club in Romeoville. 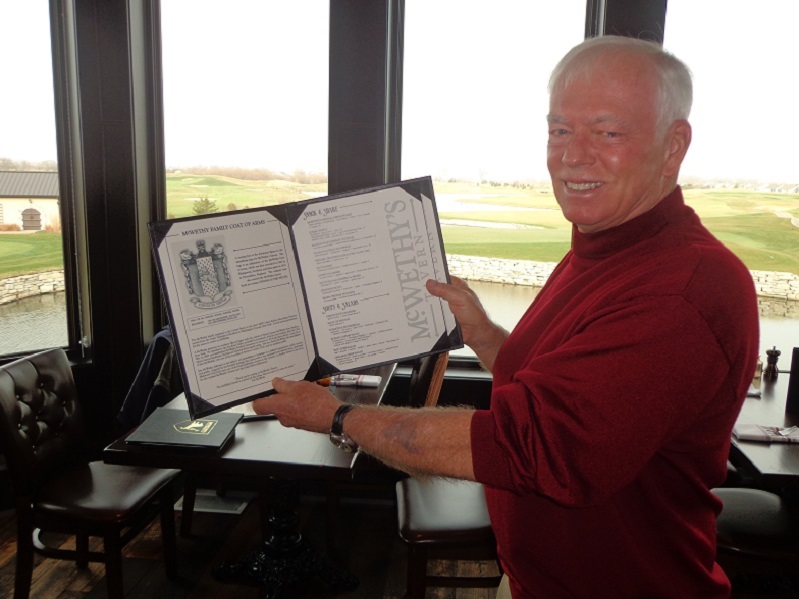 McWethy’s Tavern at Mistwood Golf Club is open all year round. The McWethy’s Tavern Executive Chef Mark Angeles and the crew with be at the Romeoville Beer & Bacon festival this Saturday night April 2nd, at the Edward Hospital Athletic & Event Center on Rt. 53. To purchase your tickets visit Rvbeernbacon.com. McWethy’s Tavern is hosting it’s first Craft Beer Dinner Thursday April 7th from 6:30 to 9 Pm. Four courses of food and then the beer. Space is limited. 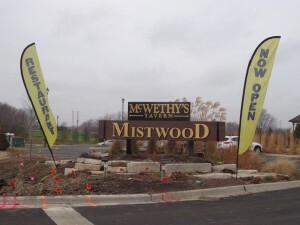 McWethystavern.com (815)-254-7001. 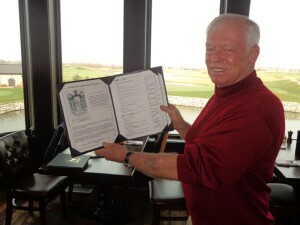 The Mistwood Golf Club designed by Ray Hearn is expected to open in early April. AIR FORCE ONE has continued it’s release of the new clubs, with the release of the AFX Game Improvement iron set. The new set has similar modifications that were seen on the AFX Pro Series irons. that includes the thinning of the top line and the sole for forgiveness. The AFX Improvement Irons now have three different club heads within the set. The 3-4 Irons have Nitrogen Charged hybrids, have 17-4 stainless steel heads that are pressurized with Nitrogen. They have FFT Face Flex Technology that helps power the ball by flexing inward at impact before springing forward to launch the ball at a higher velocity. The 5-7 Irons have a Nitrogen Charged, 431 Stainless Steel clubheads that are hollow in the middle, which according to Air Force One delivers more power and a solid feel. the oversized clubface, along with a progressive offset that helps golfers get the ball airborne. Irons 8-PW are cavity back, 431 Stainless Steel clubheads that have a deeper undercut cavity that will help ease the ball in the air for more consistent distances. Larger clubfaces help golfers get more loft on the ball. “One advantage we have with this set compared to the competition is our Nitrogen Charged Technology,” said AFO President Ross Kvinge. Look for more information online for Air Force One golf clubs. 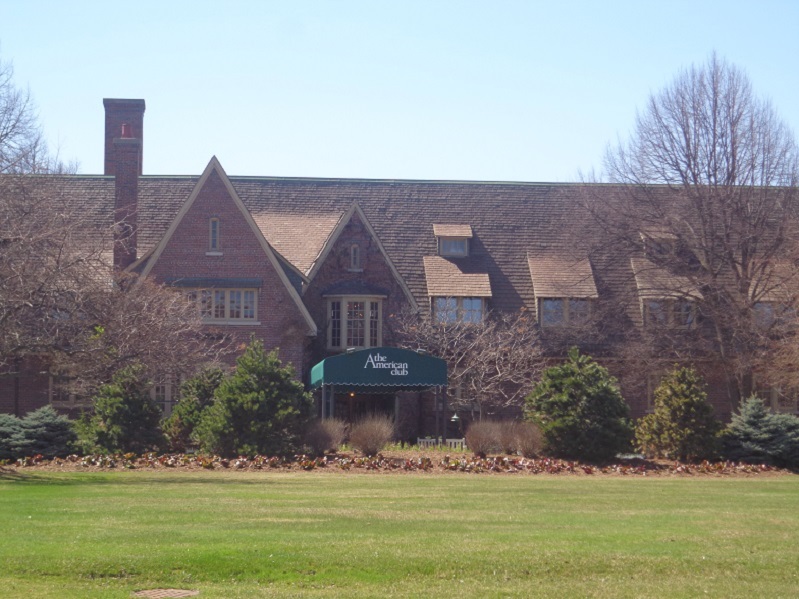 The Woman’s Western Golf Assocation (WWGA) will hold it’s 117th National Amateur Championship in June of 2017 at the River Forest Country Club in Elmhurst. The WWGA will hold their national amateur championship this summer as well. At the Dayton Country Club from June 20-25. With the WWGA national junior championship at the Blackhawk Country Club in Madison. For more details please visit WWGA.org. Links Capital Advisors has just announced that one of it’s new listings the Pacific Golf Centers in Santa Cruz California, has just announced a new asking price of only $499,000. This property has a positive cash flow. For more information contact Chris Charnas at chris@linkscapitaladvisors. A great Northern California location. The wait is over. Right now you can go to Cog Hill and order the new Under Armour Golf Shoes. For information on tournaments and all of the new and returning memberships, contact Cog Hill at online at Coghillgolf.com or call (866)-COG-HILL. 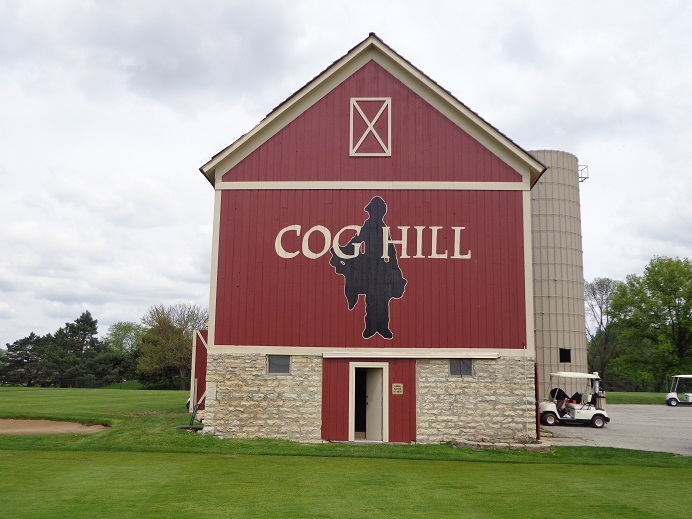 Is your junior golfer signed up yet for the Cog Hill summer leagues, call today. 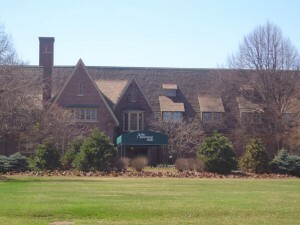 Live north call Pine Meadow in Mundelein (847)-566-GOLF. FOXFORD HILLS in Cary has two fun events coming up. The 4-man spring scramble this Saturday April 2nd, starting at 7 AM. Okay, need a later start time, how about night golf on Saturday May 14th, teeing off at 5:30. Call (847)-639-0400 or online at foxfordhillsgolfclub.com. GUSTBUSTER the worlds Smartest Umbrella, and leader in wind-release technology is in the new again. Gustbuster has been seen on the campaign trail in the hands of golf course owner Donald Trump. 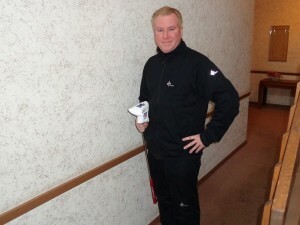 For more information on the leader in golf umbrellas see GustBuster.com or call (888)-GUSTBUSTER. AVEO golf wear for BIG and TALL men created by Darius Hicks and Randy Peaches has now launched the new Hero-Short Sleeved Golf Polo ($74.99). The new Hero does everything a golfer needs and is available in red, white and blue. You can order the new Hero Polo at Aveogolf.com. Or online at Dicks Sporting Goods, Golfsmith or TGW. THE GAYLORD GOLF MECCA is back with FREE GOLF on the weekend of April 22nd-24th. This includes free golf at places like Treetops Resort and the Ostego Club. For more information on all course and hotels that are participating, along with how to obtain FREE GOLF see Gaylordgolfmecca.com/free-golf-weekend-21/. BIG 3 Partner Len Ziehm, has the Ziehm machine rolling again. BIG 3 Partner Len Ziehm has the Ziehm machine rolling again, as it steams towards Chicago. Ziehm has been to Raleigh-Durham, and Pinehurst North Carolina, before he turned east and headed to the Outer-Banks on the ocean. The golf that he has experienced in the past two weeks, and the way he has been rolling down the fairways, is posted at Lenziehmongolf.com. BIG 3 partner Tim Cronin’s Illinois Golfer is out. See Illinoisgolfer.net. 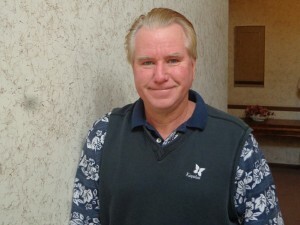 FOR ALL THE DETAILS OF what’s happening at DuPage Golf, see DuPagegolf.com. Oak Meadows might be closed renovation, but plenty is going on at Maple Meadows and Green Meadows. THE GOG BLOG by Rory Spears. Editor and Director of Content, follow Rory on Facebook, Linkedin and Twitter @GogBlogGuy. Kapalua Maui our theme today. Yesterday was Easter Sunday and it was supposed to be a great day, but if you knew Gary Planos, yesterday wasn’t so special after all. The news started to break in the afternoon and before long, golfers everywhere who have been to Kapalua or have played in the pro-am of the Western Open or more recently the BMW Championship had their heart sink hearing that Planos had passed away at the young age of 62. While we all wait on the results of an autopsy, it’s believed that it was a heart attack that struck Planos in his Maui home, either late Friday night or Saturday morning. Gary Planos usually had a colorful Hawaiian shirt on at most times. Planos had several different roles at Kapalua over the years, he also ran the Tournament of Champions that in all reality starts the PGA Tour season every year. When he wasn’t taking care of PGA Tour professionals, or other stars, he was taking care of people like you and me. More often than not his sentences ended with, what can I do for you, or what do you need. Look up the term “people person” in the dictionary, and your likely to find a picture of Planos. When it came to the terms of setting up your stay in Maui Hawaii, you knew you were in good hands with Planos. Planos had nicknames like the “Mayor of Maui or Mr. Kapalua”, both of them and several others were all well earned. When it came to taking care of people, Planos got it. Today there a whole lot of people in the hospitality industry who could have learned a thing or two from Planos. If only all my golf trips had people like him waiting on the other end, when I arrive. The Butterfly logo of Kapalua. Planos a native of Evanston, and an alum of the University of Illinois and the Western Golf Associations Evan Scholars program, learned the game at the Peter Jans golf course in Evanston. His grandfather ran the halfway house and when Gary showed up, he had a habit of eating up many of the hotdogs that his grandfather had made for hungry golfers. 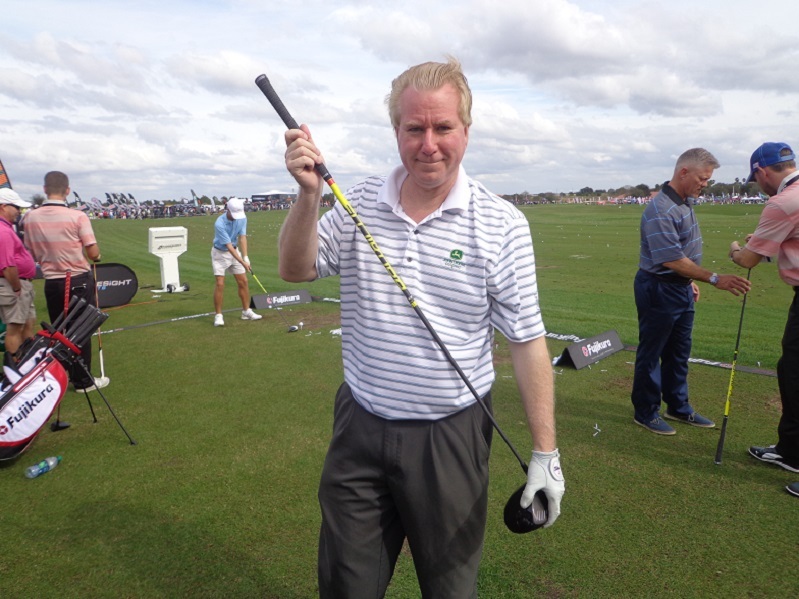 Finally in an effort to make a profit, some smaller sized clubs were found for Gary so he could start playing golf. It’s sad that the Peter Jans golf course now known as Canal Shores, is about to get a great renovation and Planos won’t be back to see it take shape. Something tells me he will be looking down as the project comes together. Planos started his quest here for an Evans Scholarship at Westmoreland Country Club, caddying while attending the University of Illinois. After college Planos found a connection that suggested he go try Hawaii one winter, a new resort was opening on Maui. So off he went with some cash and travelers checks in his back pocket. He started 4,000 miles from home working for $3 dollars an hour as a bag boy and sharing a room with several other guys who were doing the same thing. During his years in Hawaii it’s believed he held some 11 different postions, leaving Kapalua once to work the other side of the island, and then returning when a better job opened up. 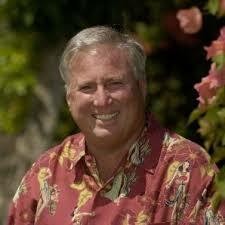 Through the pro ranks and then running the entire resort, and helping Kapalua grow. He was always proud of the progress Kapalua made over the years he was there. 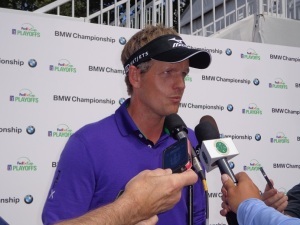 You can tell just how much, during an interview I did with him back in 2007 at Cog Hill during the BMW Championship. Make sure you take note of his last answer. Click here to hear my interview with Gary Planos, about everything golf and Kapalua. My trips to Maui started in 1998, and I have the current Mr. Golf Kapalua Mike Jones to thank for that. Mike hooked me up with Gary when I said I was looking into making my first trip to Hawaii. That first trip went so well, I just kept going back. While I did take time to see the other islands, every trip included a stop at Kapalua. More often than not, Gary’s parents would be there during my stay every February, while the Ice-capade’s would invade the United Center for two weeks. I would arrive and go check in with Gary, who would tell his folks I was there. I would stop at their villa and Joe Planos would greet me at the door with a cold beer in hand. It was easy to see where Gary learned about hospitality. There are people Planos paired me up with on Kapalua’s golf courses, that are still my friends today. I just got off the phone with one of them and if you have ever been to Branson, you know the best fiddler in the Midwest Shoji Tabuchi, who was just as saddened to hear the news. I can bet you that people like former New York Yankees skipper Joe Torre who like Tabuchi is a long time Kapalua regular, is crushed as well. So must be the folks at Maui Jim sunglasses, it was Planos who helped put them on the map from day 1. There are many upset PGA Tour professionals today as the word about Planos spreads. Odd’s are if your from Chicago and you have been to Kapalua, or played golf there you knew Planos, or got hooked up by someone who did. Almost every time I wear the Kapalua Butterfly logo somewhere, someone asks me if know Gary Planos. Doesn’t everyone was always the easiest answer. At the end of my first trip to Kapalua in 1998, I had played six rounds of golf. Two on each of the three courses at the time, the Bay, Village and the tournament course the Plantation. During my four rounds on Bay and Village, I lost like only one golf ball. On the Plantation course with the wind howling both rounds, I lost another 11 balls. Making it a dozen for the whole trip. After my final round of the trip I stopped in Gary’s office to say good-bye. I told him the Plantation course has cleaned me out of golf balls, and I was down a full dozen. Planos replied, “no problem, we have a ball replacement program here at Kapalua and now your in it.” with that he turned to a big cabinet in his office and open the doors and said, “you play Titleist”. When I responded yes, he grabbed a dozen logo’d Titleists with the Mercedes Championship logo on them and handed them to me. “Now your even”. If there are any local arrangements for Gary Planos, the Gog Blog will post them ASAP. 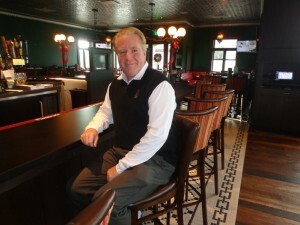 THE GOG BLOG by Rory Spears in McWethys Tavern at Mistwood Golf Club. Follow Rory on Facebook, Linkedin and Twitter @GogBlogGuy. 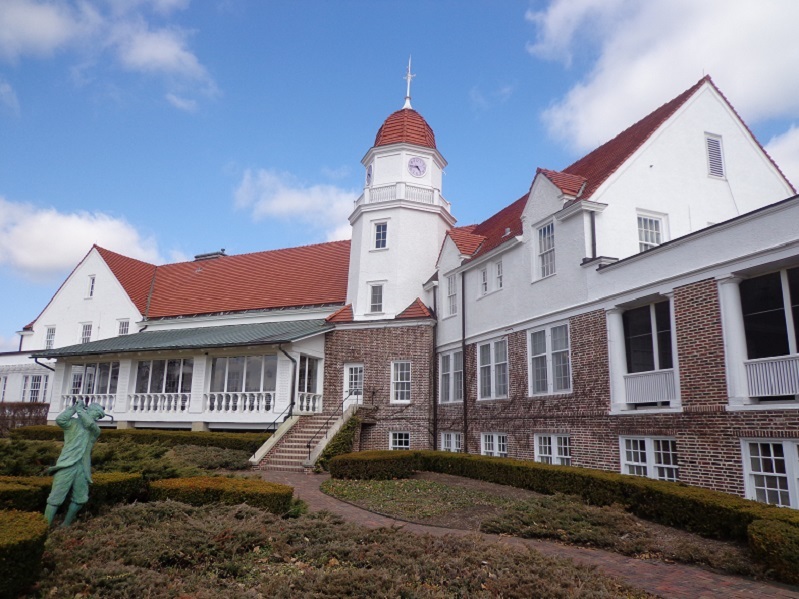 The historic and famed Chicago Golf Club in Wheaton will host the next USGA event in the Chicago area, when the inaugural U.S. Sr. Women’s Open comes in July of 2018. The Charles Blair Macdonald statue outside the clubhouse. The Chicago Golf Clubs famous logo, Far and Sure. When the final putt fell at Olympia Fields last August during the U.S. Amateur Championship, the United States Golf Association was done here in the Chicago area. It marked the first time in decades that anyone could remember, the USGA not having a future event on the calendar in the Chicagoland area. 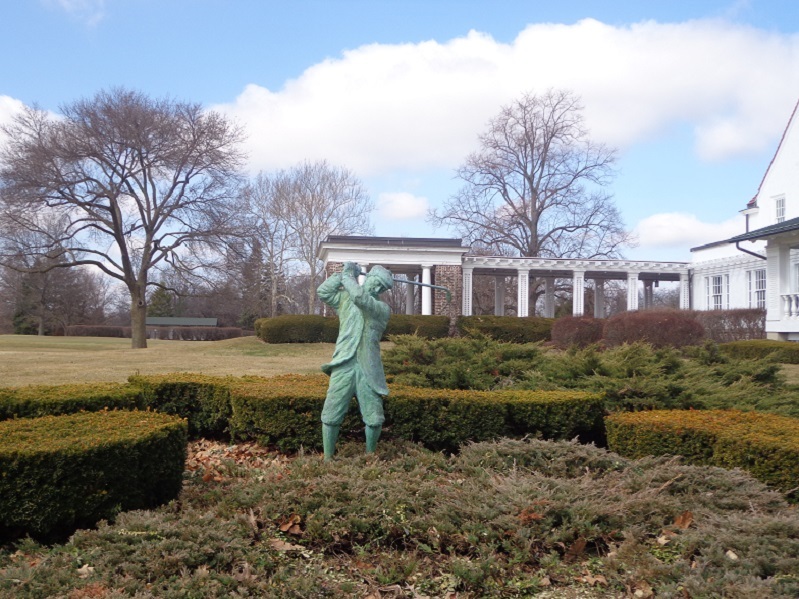 The USGA and the PGA of America both had Chicago and it’s area clubs off the radar. During an interview with then USGA President Tom O’Toole, O’Toole suggested to the local media in attendance at Olympia Fields that it was time for the media to convince our local clubs to start sending invites to the USGA, that they were ready to invite the USGA back to town. 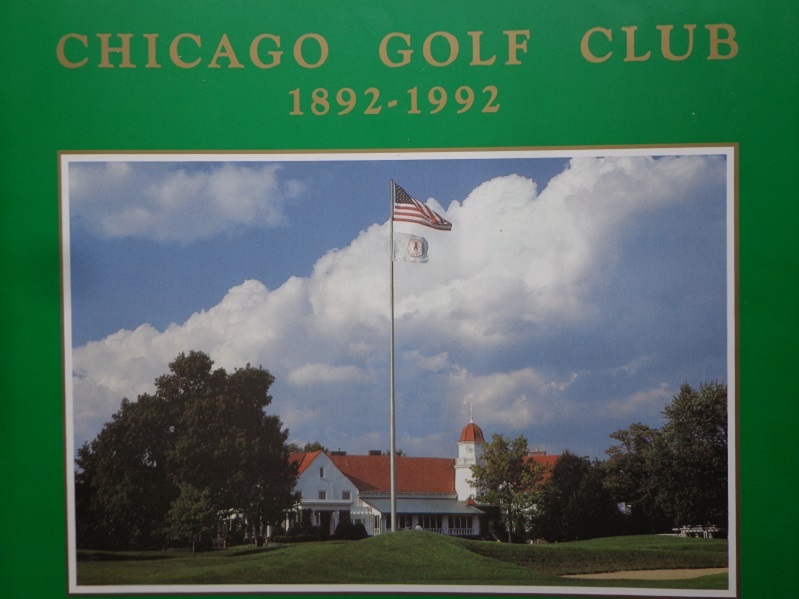 Fortunately for the golf fans of Chicago, what was already in the works was the USGA and one of it’s founding members the Chicago Golf Club, discussing the very first U.S. Senior Women’s Open coming to Chicago. “The USGA was looking for a location that had a wow factor,” says Brad Kinsey, president of the Chicago Golf Club. Chicago Golf did succeed in landing the inaugural Sr. Women’s Open, while Peggy Kirk Bell’s Pine Needles Resort in Southern Pines North Carolina received the second one. The Chicago Golf Club’s centennial book tells an amazing story about one of America’s most historic golf clubs. But for Chicago area golf fans, and golf fans from further destinations that are likely to attend, the 2018 U.S. Sr. Women’s Open will be as much about the chance for spectators to walk the grounds of Chicago Golf, as it will be to see who wins the championship. The story line is amazing and will bring another great chapter in the game of golf’s history. How much do we know about what July of 2018 should look like at the Chicago Golf Club. The field for a U.S. Open will be smaller than normal, with only 120 players. 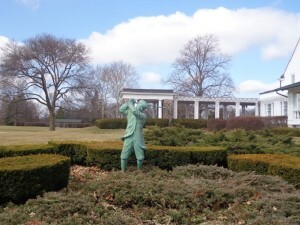 As Chicago Golf Club is more suited for a smaller field with the facilities it has. In fact the club did not have air-conditioning in 2005 for the Walker Cup, so it was brought in for the week. For more details on how this inaugural championship came together, and what it might look like when it tee’s off in 2018, the Gog Blog spoke with the Chicago Golf Club’s President Brad Kinsey. With the championship still 28 months off, there is still some planning to be done and details to work out. But here is where things stand fresh off the announcement, that the USGA is back on the schedule in Chicago. 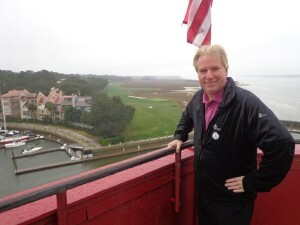 Click here to hear the interview with Brad Kinsey, President of the Chicago Golf Club. What the Chicago Golf Club should provide this USGA championship, is a place where the atmosphere is contained and spectators will feel like they got to see the entire golf course and the championship during that day. The Gog Blog and Golfers on Golf Radio will continue to follow the championship over the next two-plus years, as it gets closer to teeing off and making golf history. For more information on the championship, see USGA.org. Jim McWethy invites everyone to come try McWethy’s Tavern at Mistwood Golf Club located in Romeoville, enjoy the mixture of a golf and fine dining environment at McWethy’s Tavern on Renwick Road, call for reservations at (815)-254-7001. Roger Cleveland of Callaway Golf, has created a superior line of new custom wedges that are in your pro shop, don’t let your short game suffer through another golf season. Visit Callawaygolf.com and your pro shop or retail store. Demand more, demand Callaway. Sorry for the delay in updates golfers. As the Gog Blog machine has been under the weather, and so has it’s operator. What made matters worse was looking out the window and seeing that white stuff come back for a visit. At least it was less than 1 inch. Better news is that the white stuff melted off and the Gog Blog is starting to get back on it’s feet. 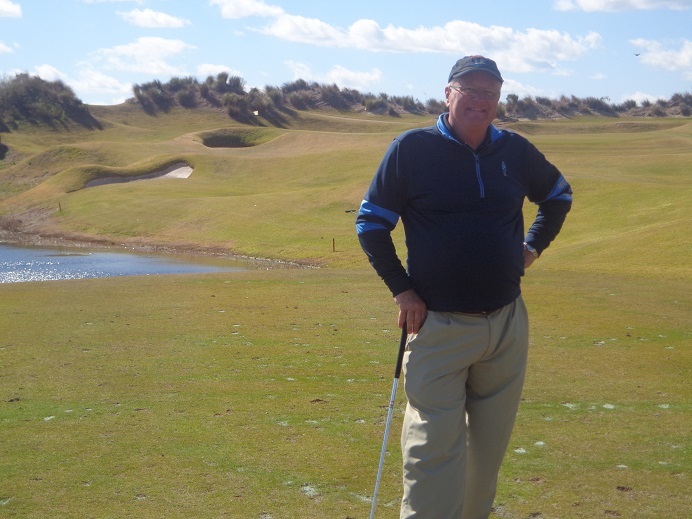 The Gog Blog earlier this week did manage to get an interview with President of the Chicago Golf Club in Wheaton, about getting back in the USGA cycle by taking on the inaugural US. Sr. Women’s Open in 2018. Which gets posted tomorrow. Coming up before too long will be our feature on the Streamsong Song Resort, the Florida Resort has a third course being built by Gil Hanse. 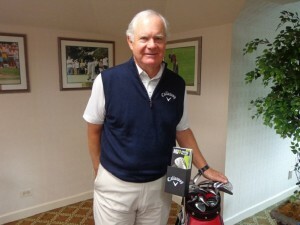 For more golf news stay with the Gog Blog all weekend long. The Gog Blog hopes you feel better than we do, but at least it’s not summer…yet. If you watch golf, especially the week after the Masters Tournament has been played, you will see one of the great landmarks in golf. Once you have seen the famed lighthouse that sits behind the 18th green at Harbour Town Golf Links at Sea Pines, you will never forget it. Once you have been in it, and gone all the way to the top, and taken a walk around the deck, the history of it sticks with you even more from that point on. There are golfers who strive to make a great score on the last hole at Harbour Town, just to make par or better on the lighthouse hole. PGA Tour players usually are trying to make birdie there to win the Heritage and earn a nice new red jacket the week after trying to get a green jacket. 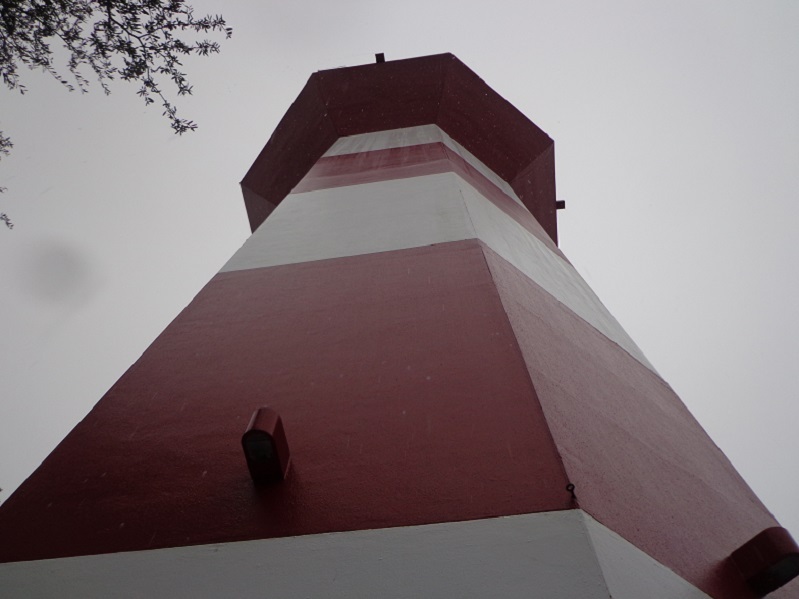 The lighthouse stands tall at Sea Pines. The lighthouse itself is some 70+ feet tall, if you go inside it you can see how high you are climbing, but the footage signs on the walls. Inside the light are not one but two gift shops. One on the ground floor and one more at the top of the lighthouse. You can walk outside from the lighthouse and around the upper deck walk walkway. The view is very good. The new clubhouse at Sea Pines, is one both the PGA Tour players and the guests and homeowners will enjoy. The views at Sea Pines are getting better due to a 65+ million dollar renovation project that is currently on-going. It starts right at the clubhouse which is brand new and outstanding. The tour players had really soured on the old clubhouse, but should love the new one, complete with a new large locker room and players lounge that overlooks the 9th green. While the clubhouse is great, the renovation did not stop there. The “Wall of Champions” has been redone outside the clubhouse. Need more, well there is a new beach club with both a pool and a view of the waterway. Sea Pines Plantation (all developments are plantations on Hilton Head Island) does have more than golf course. The 9th hole on Harbour Town Golf Links, looks great even on a rainy day. Harbour Town gets the TV time but the other courses are well worth the time to play. Architect Pete Dye who along with Jack Nicklaus created Harbour Town, has just wrapped up work on Herron Point his second course at the resort. Dye was recently recalled to update the course he designed years ago. Currently Davis Love III and his brother Mark are working on the Ocean Course at Sea Pines originally done by Mark McCumber. Harbour Town itself was closed after Jim Furyk won the RBC Heritage in 2015, and course saw the greens get re-grassed and other improvements made. It will be in great condition for the tournament that is just under 30 days away. 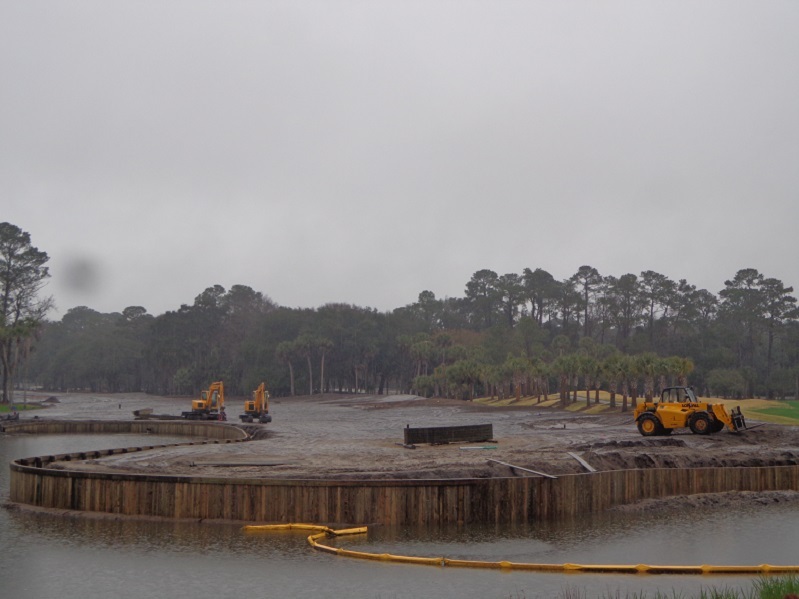 Renovation crews took the day off due to the rain of the day, but work continues here on the Ocean Course at Sea Pines. It should reopen in late September. 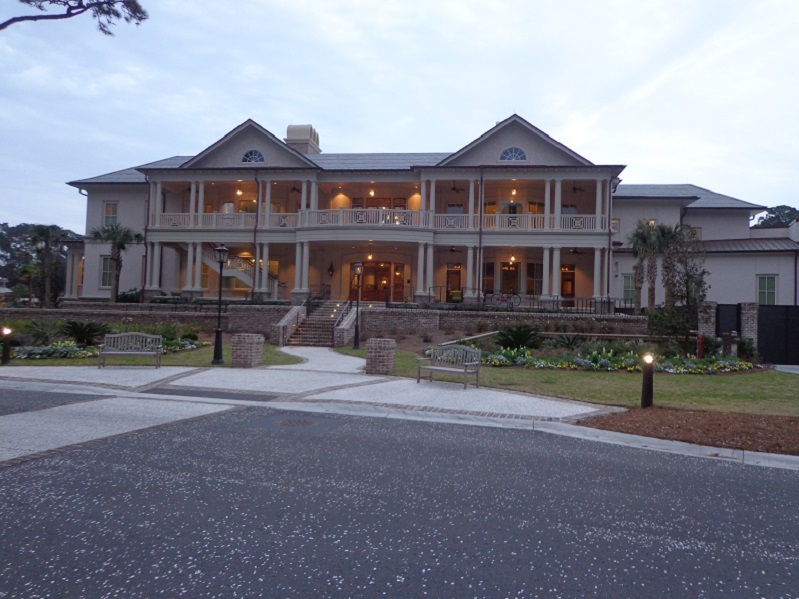 The new clubhouse at the Ocean Course and also serves the Herron Point course is another part of the major upgrades at Sea Pines. 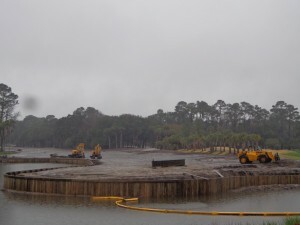 Even with all of the upgrades not complete at Sea Pines. Various media publications are bestowing awards on the resort. Best new clubhouse of the year, golf course of the year, winner of best golf destination of the year, and others. If you haven’t been to Hilton Head, it’s time to go, if you have been on the island but it’s been a while. Well its’ time to return. 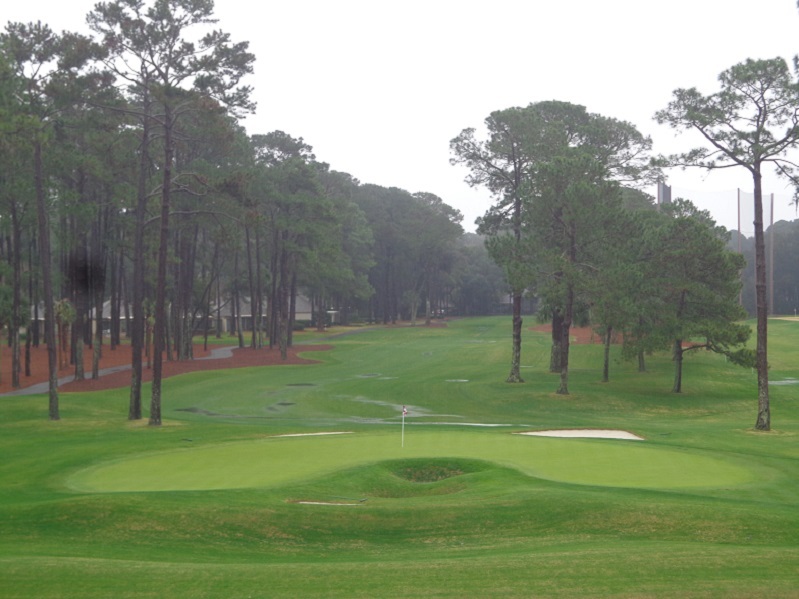 Besides golf there is plenty to do at Sea Pines and around the island. 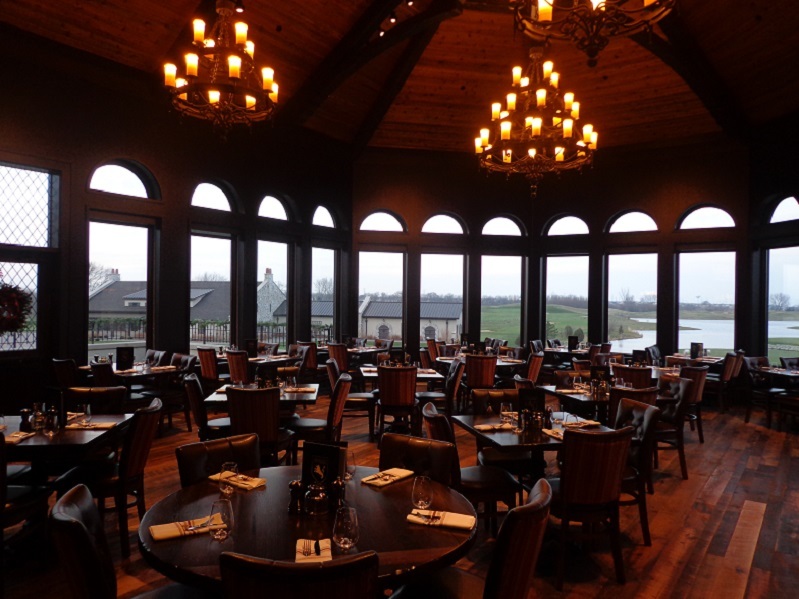 The British Open Restaurant is another great place to eat and enjoy a golf related atmosphere, especially during the Open Championship week in July. For more information on Sea Pines and all it now has to offer visit Seapines.com or you can call (800)-SEAPINES. For groups or packages call Chris Beck (843)-842-1488 or email Chris at cbeck@seapines.com. For more on Hilton Head Island see, Hiltonheadgolfisland.com It’s time to visit the Low Country of South Carolina. RORY SPEARS, EDITOR AND DIRECTOR OF CONTENT FOR THE Gog Blog, Follow Rory on Facebook, Linkedin and Twitter @GogBlogGuy. With the Cross Golf All-weather suit. The temperature has dropped again but it’s only spring, not summer and it’s only March not April. But all of us golfers that have recorded a few outdoor rounds, are ready for more of them, but in the meantime do go hit the domes, they could use some business before the get collapsed for the summer. Most of the golf courses around town have opened up, except for some privates and a few of the top public’s. Patience everyone warm weather is coming. It was hard not to hear all the stink coming out of Bay Hill early last week, when the talk was about who was there playing and who wasn’t. Reports said the top 5 European players were there, and the top 5 american’s were not. In fact only 8 of the top 24 american’s were in the field. Bill Haas who took second place last week at Innisbrook in the Valspar Championship was notable absentee as well. Why Haas you ask, well Haas attended Wake Forest University the Alma mater of “The King” himself, and went there on the Arnold Palmer Scholarship. But yet Haas for the second straight year skipped Palmer’s invite at Bay Hill. I’m sure Haas had his reasons, and so did the others. But the question got raised and loudly by NBC/Golf Chanel broadcaster Peter Jacobson, why aren’t these players here, and why insult Arnold Palmer by not coming. 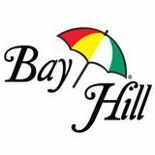 Perhaps the bigger question is, what will happen to the event, and Bay Hill come the day Palmer is no longer here. The speculation is that it will look like what has happened to the Byron Nelson event in Dallas since Nelson passed away. What has happened is that the players are staying away. Not even a great renovation by former PGA Tour professional D.A. Weibring has brought the players back. Spieth is likely to play because of his local connections, and tour players love having a home game. But who else is likely to join him. I’m sure it’s only a matter of time before the same questions are raised about the Memorial Tournament and what happens after Jack Nicklaus is gone. It’s hard to say that every player needs to be at Bay Hill to salute Palmer, but if I’m on the tour I’d do my best to be there while Palmer is there. When Arnie is gone, then I guess the players can choose to be absent as well. But if I know Palmer, it’s not likely he’s insulted by someone not coming, he will enjoy the company of the players that did tee it up last week at Bay Hill. In the meantime congrats to Jason Day, wire-to-wire winner. He is real threat now at Augusta, major #2 could come his way quickly. BIG 3 PARTNER LEN ZIEHM is on the move, as he works his way back to Chi-Town, he’s in Raleigh-Durham seeing family and watching his grandson get introduced to golf via a local First Tee Program, his report at lenziehmongolf.com. IF YOU haven’t joined the site the last few days, Titleist has kept me busy with all their new product releases. Scotty Cameron Putters, Bob Vokey Wedges and new carry bags that are lightweight, scroll down a few stories and catch the details. Titleist really does continue to turn out quality products for golfers. I’LL HAVE MORE DETAILS SOON, but for those who have asked. Yes Golfers on Golf Radio is returning in 2016, our first show will hit the airwaves on April 17th at 9 AM on WSBC AM 1240 Chicago. THE GOG BLOG by Rory Spears, Editor and Director of Content. 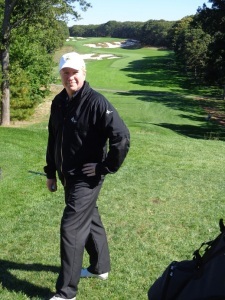 Follow Rory on Facebook, Linkedin and Twitter @GogBlogGuy, with the Titleist bag on the Bethpage State Park Black Course. Titleist has created a new stand bag called the Titleist 4UP StaDry. The StaDry is a lightweight waterproof performance bag for the dedicated golfer. The bag will be available in golf shops this month. Weighing just 3.5 pounds, it is the lightest bag that Titleist has ever created. The name 4UP, is in reference to the bags advantages. The 4UP design was created with a lightweight, durable nylon waterproof shell, that includes a three-way divider, foam-padded straps for the most comfort and cushioning possible and storage space. The bags aluminum legs are tough and durable, but are lightweight. A new Active Recoil Stand System, allow for an easy activation. What the PGA professionals are saying. The 4Up Stand bag is one of 15 models of Titleist golf bag models in the 2016 Titleist Golf Gear Line. The new 4Up StaDry golf bag ($245 MSRP) is available this month in pro shops and golf retail stores. The bag comes in four colors, Black/Red Charcoal/Orange, Charcoal/Lime and Navy/Blue. THE GOG BLOG by Rory Spears, Editor and Director of Content. Follow Rory on Facebook, Linkedin and Twitter @GogBlogGuy in the All-weather Cross Golf Suit. The best news of the month is that the golf courses for the most par have opened. I have received notices that the following courses have opened for the summer golf season. Arrowhead in Wheaton, Mt. Prospect, Deerfield Golf Course, White Deer Run in Vernon Hills, most all of the courses operated by Billy Casper Golf or GolfVisions. Some courses that are operated KemperSports Management. At Cog Hill Courses 1,2,3 are open with #4 still about 3 weeks away. At the DuPage County Forest Preserve District both Maple and Green Meadows are Open, while Oak Meadows continues it’s renovation and will reopen next year. Buffalo Grove is open, Nickol Knoll in Arlington Heights is open, and Chevy Chase in Wheeling is open. If in doubt call your favorite course or check their website. You might be able to go play this afternoon. 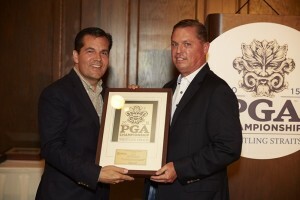 Kohler Company Director of Golf Jim Richerson (R), receives and award from PGA President Derek Sprague (L). Kohler Company’s Jim Richerson is bringing home the award hardware. 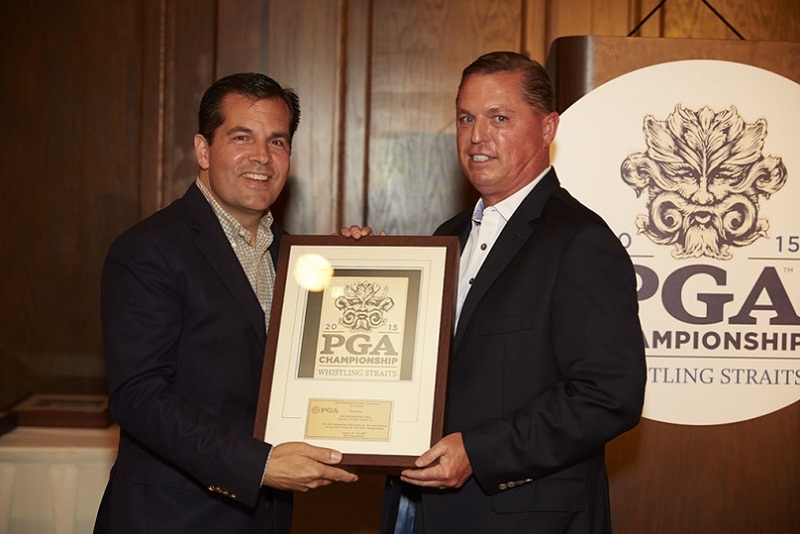 Richerson is who is currently running for PGA of America National Secretary, recently was awarded by the Wisconsin PGA Section as the professional of the year for 2015. Richerson was joined at the awards ceremony by Kohler Company Merchandise Manager Josue Reyes, who was honored as the WPGA’s merchandiser of the year. Richerson will find out this November if he has been elected to the secretary position on the national board of the PGA of America. 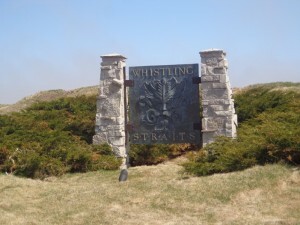 Welcome to Whistling Straits in Haven/Kohler Wisconsin. The touring golf professionals won’t be in Haven/Kohler this summer, so there is another reason you should be. In addition to the great golf, from April 29th through May 1st is the Kohler Festival of Beer. It’s the 8th annual, and if you enjoy beer and have not been to the first seven, you have been missing out. Check out Destinationkohler.com for more details. Kohler golf received more awards from both Golf Digest and Golfweek magazines with the release of their respective Top 100 Greatest lists. Whistling Straits that just served as home of the 2015 PGA Championship, was named the 51st best course in the world by Golf Digest. 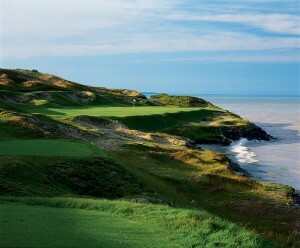 Kohler golf consists of four golf courses, all of them are on top 100 or best in state lists by various publications. Kohler Company will soon be announcing opening dates for the summer ahead for all four courses. 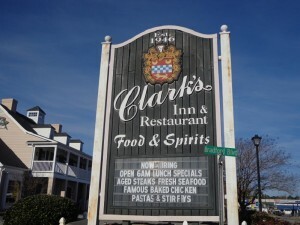 Clarks Inn and Restaurant in Santee South Carolina. Santee South Carolina, home to some of South Carolina’s best golf away from the shoreline, has added yet another reason to drop into town. Are you a Tesla car owner ? Well if so Clarks Restaurant the center piece of Santee has added a Tesla charging station for golfers and other travelers alike. 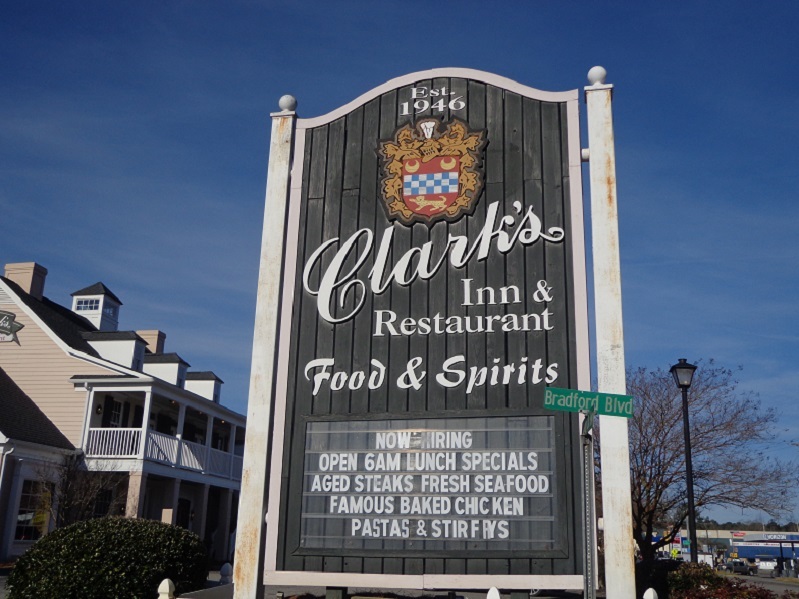 Now you can charge your ride in less than one hour at Clarks, home of the South’s Best Road Food says Southern Living magazine. Clark’s in the heart of Santee since 1947, while in town pull out the clubs and visit courses like Santee National and Lake Marion, they are great golf at a good price. See SanteeTourism.com for more details. Chris Charnas and Links Capital Advisors have announced that their current listing, The Course at Aberdeen is now listed at $1.5 million dollars. The course is just minutes away from Valparaiso University in Valparaiso Indiana. Contact Chris at (847)-866-7192 or at Chris@linkscapitaladvisors.com for more information. Are you ready to own your first golf course or add to your collection of properties, call Chris Charnas today. BUFFALO BRAND INVIGORATION GROUP, has announced the promotion of Glenn Gray to Vice President. Buffalo BIG is a full-service global agency that represents golf, sport, lifestyle brands, destination properties and communities. The announcement was made by Rich Katz, Managing Director of Buffalo BIG. Golfers on Golf congratulates Glenn Gray on his promotion and looks forward to continuing it’s relationship with Buffalo BIG. KEMPERSPORTS and the KemperClub have launched a National UNO Hole in One promotion. Golfers whomake a hole in One at participating KemperSports golf Course can win a trip for two to Mexico’s Vidanta Resort for 7-nights. This promotion is now underway and runs through the end of the year. The resort has both golf on a Jack Nicklaus 18 hole design golf course and a Greg Norman course that has 9 holes open, with 9 more to open this April. This fall a lighted 9 hole course will open as well. To learn more about the promotion visit Kemperclub.com. The 2016 Golf Fashion Show to benefit the First Tee of Greater Chicago and the Illinois PGA Foundation, is scheduled for April 7th. The party is also a Masters viewing party. Regular tickets can be purchased for $85 dollars or the VIP Ticket (with limited availability) for $150. The regular ticket gets you inside the fashion show, but the VIP ticket allows you reserved seating and three super raffle tickets for amazing prizes including, tickets to the Luke Donald Wine tasting. 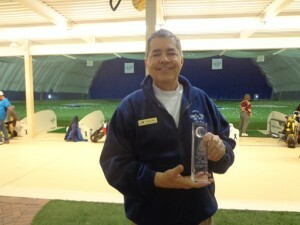 For more information visit Thefirstteegreaterchicago.org or the Illinois PGA Foundation website. CONGRATS to Northwestern University Director of Golf Pat Goss on his election to Executive Director of the First Tee Foundation of the Greater Chicagoland Area. Len Ziehm of the BIG 3 partnership is still on the road in the Ziehm Machine, but is working his way back to the Chicago area for the summer. Currently Ziehm has just posted at Lenziehmongolf.com a full report about golf in Myrtle Beach South Carolina, checkout Len’s latest travel pieces all year round. ANTIGUA GOLF based in Peoria Arizona, has put it’s spring of 2016 Men’s Performance-72 collection on the shelves. The influence of the previous season’s electrified bright colors pattern has changed to a simplistic bright color stories found in fashion products from Shoes,bags and belts to men’s and women’s golfwear. Antigua’s 2016 Men’s fashion styles complement a new color direction. For more Antigua.com or visit ShopAntigua.com. AVEO a 4-year old company has created a line of golf clothes for men who fit into the Big and Tall category. Designed by Big and Tall golfers Darius Hicks and Randy Peaches, Aevo have expanded on what many current retail offerings are. For 2016 Aveo has debuted both men’s bottoms and tops. Aevo clothes are now available online via Dicks Sporting Goods, Golfsmith, TGW, Austad’s, Rockbottomgolf.com and Aveogolf.com. To view apparel and place orders for clothes go to http://www.aveogolf.com/#!shop/t2bi8 Aveo is based in Rogers Arkansas. DYNAMIC BRANDS which includes Bag Boy, has announced the latest line in Quad Series Electric Carts,that are compact and Lightweight,with new Innovative Technology. The Bag Boy Company a leader in golf push carts for over 70 years, has anew line in electric carts that are 22% smaller than previous models. The new Quad Series includes the Navigator $2,195.00, the Coaster $1,595.00, and Hunter Models $1,195.00. For more information see bagboy.com or visit their Facebook page. THE GOG BLOG RETURNS ON SUNDAY with a look at another new golf product. THE GOG BLOG by RORY SPEARS, Editor and Director of Content. Follow Rory on Facebook, Linkedin and Twitter @GogBlogGuy. With a Fujikura shafted driver at Demo Day during the PGA show, Fujikura for golfers who really need to get the shaft. There is a new golf experience that is catching on in a big way, and it’s Top Golf. But don’t let the name fool you, it’s golf alright but it’s more than that. Top Golf is place that’s, a top of line fun experience. If you want golf, it’s there. So are the pool tables, foosball tables, the conference rooms, the bars, the big screen TV’s and more. The Top Golf staff will tell you that perhaps even up to 65% of their customers are not regular golfers, but then again Top Golf is providing an experience that allows people to get a good dose of golf, and is baiting the hook for many to head to a real golf course, pick up the clubs and try the real game. 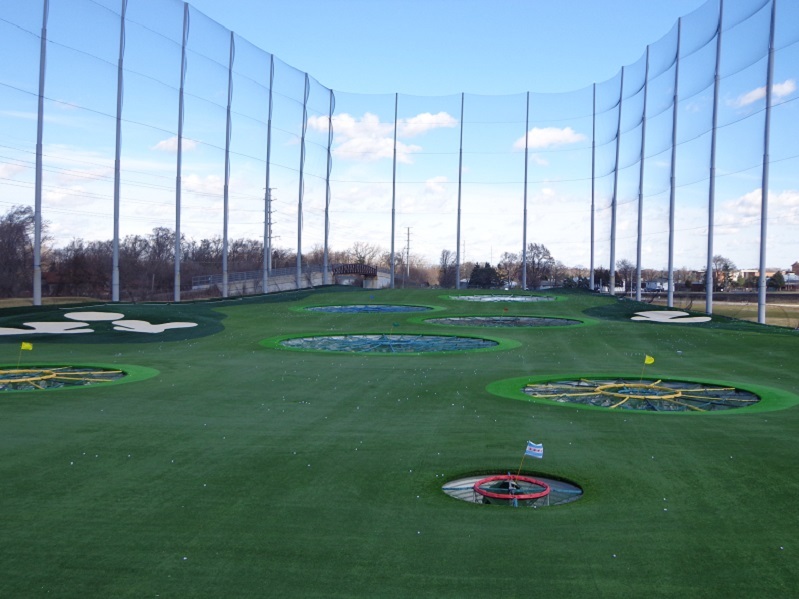 Welcome to Top Golf in Naperville, a new way to enjoy golf in a fun atmosphere. The golf game at Top Golf is a bit different that what you get at the local golf or country club. In some ways it might be more like bowling, you have your bay and everyone wait’s their turn. In bowling you could throw 20 balls, if your not making strikes. At Top Golf you hit 20 balls, 5 at a time and you do this 4 times. But unlike bowling or golf on the course, there is more than one target to pick from, in fact there are several. If you miss them you score a big fat zero, or depending on how close you get to the pin, you can score more points. The field of play at Top Golf in Naperville. While hitting the fairway so to speak is not worth any points at Top Golf, it is a way to finding out if your swing is online for that next round at the golf course. At Top Golf you do aim for the targets, just do not aim for the sand traps, because like in real golf, you do not get any points for that. 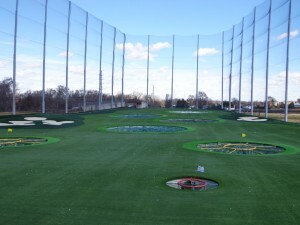 Top Golf has two locations in the Chicago area, the original one in Wood Dale on Thorndale Road, and the new location that opened last Labor Day off of Rt. 59 and Rt.88 in Naperville. The Naperville location since it’s newer, has more of the look the company is striving for. 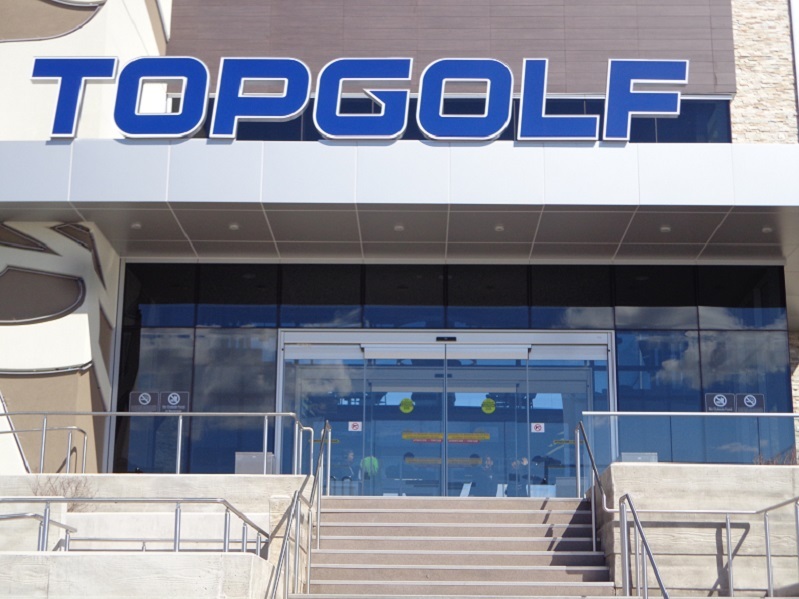 People who enjoy Top Golf are currently waiting for the new state of the art Top Golf, a 4-deck facility to open alongside the MGM Grand Hotel in Las Vegas, that is expected to be operational this spring. 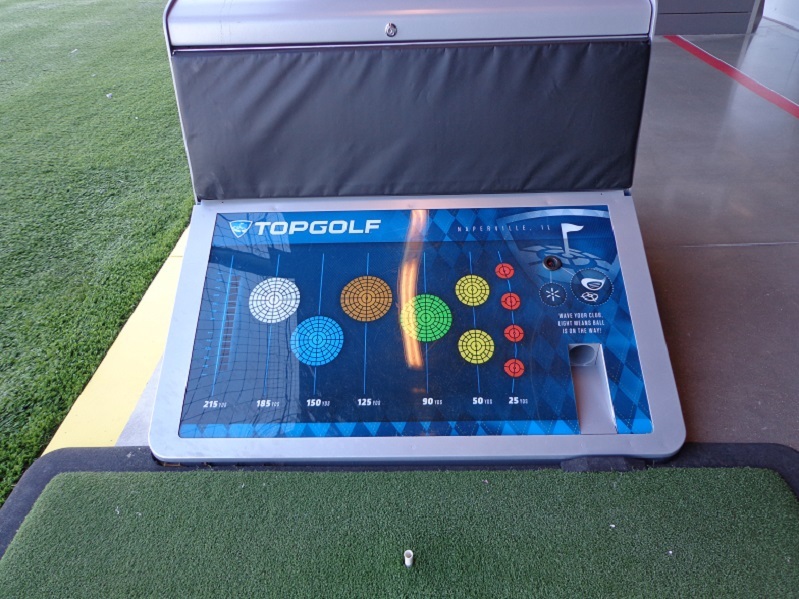 The Top Golf Game Board in the Hitting Bay gives you target information and more. 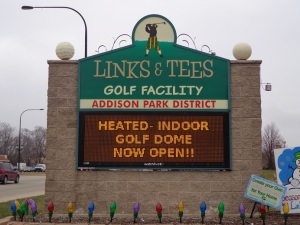 On cooler or windy days, notice the orange stripe, which is your heater blowing the warm air down while you play. The games and there are several to choose from, test all of your golf ability. 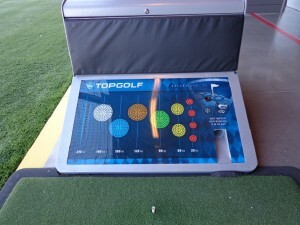 Top Golf the main game, allows for you to score points by hitting your shots with golf balls that include microchip technology, into targets that record your points. The more accurate you hit your shot and the longer the shot flies to further away targets, the more points you get. Some of the other games include Top Scramble which is just that, breaking your group into teams and playing the game in a scramble format. TopChip is like a short game area game, where you play to the closer targets. Other fun formats include TopScore, TopPressure, TopDrive (for you big hitters) and TopShot. 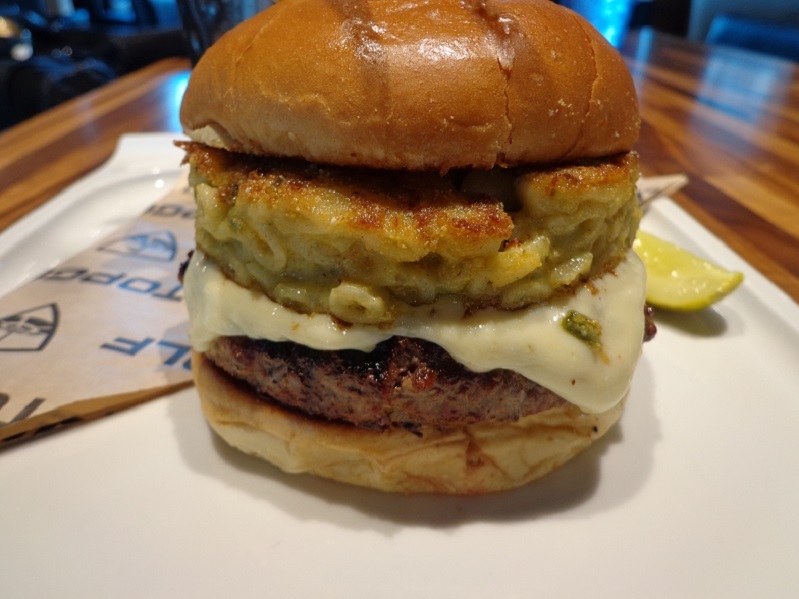 The Top Bar at Top Golf, along with the Green-Chili Mac and Cheese Burger is a house top favorite by many, (Yum). One option of the conference rooms available at Top Golf. 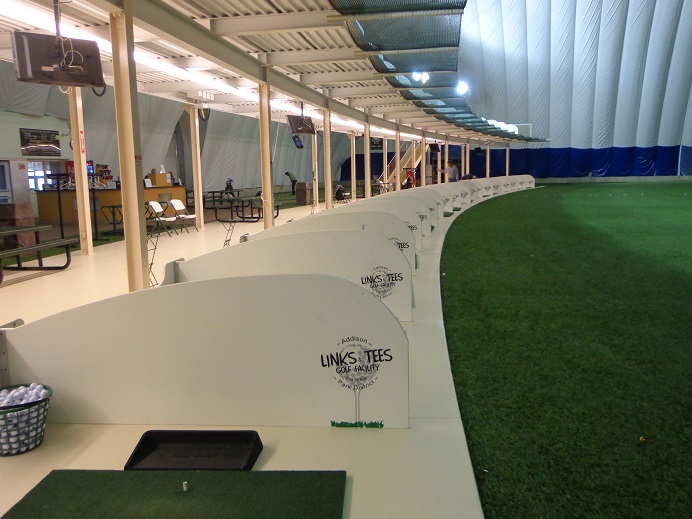 The golf games can be played at any of the three levels of hitting bays that Top Golf has. But when you move about the Top Golf facility, you can enjoy your favorite beverage at the top bar, and eat top level food, from what’s called the scratch kitchen (meaning all food is made on freshly on site and from scratch). Business meetings and business events are quickly becoming common place at Top Golf, along with banquets, weddings and more. 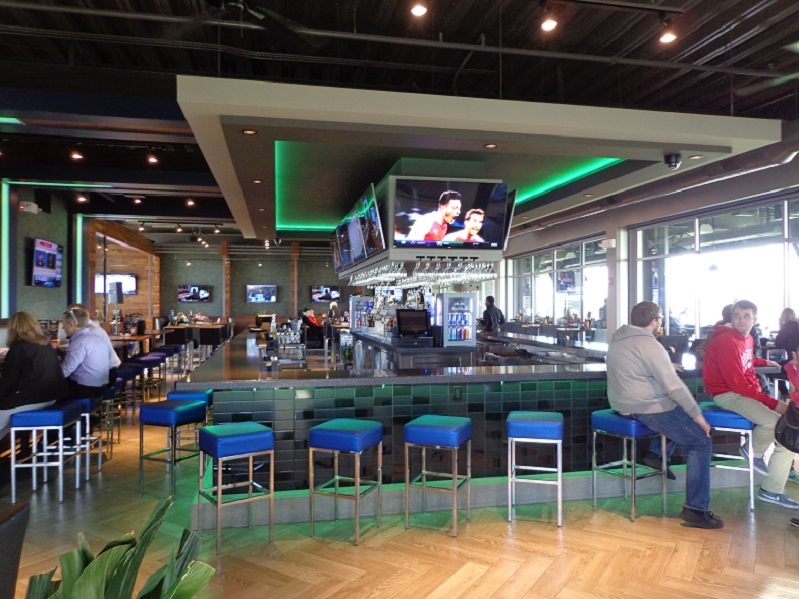 For more information on special events at Top Golf in Naperville, contact Jill Plotke the sales manager at (331)-305-2446. 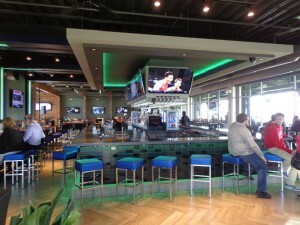 Top Golf in Naperville is located at 3211 Odyssey Court. For further information see Topgolf.com.